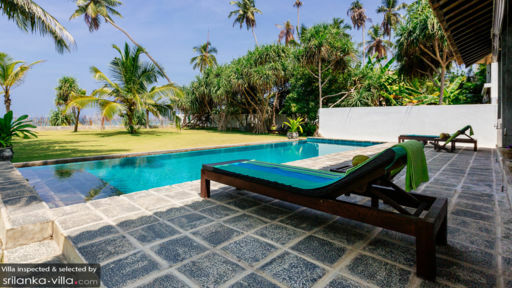 Nestled away along a secluded beach about a kilometre away from Ambalangoda town, Greenparrot Villa is a two bedroom vacation home made for travelling parties of four. 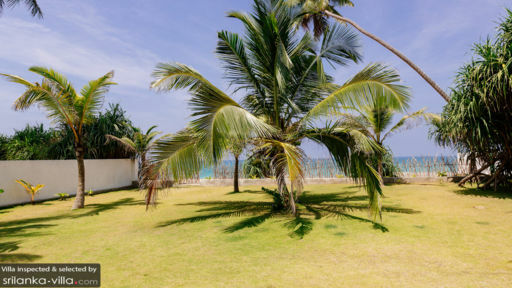 Boasting a sun-soaked garden that’s just steps away from the beach, a glistening pool with views out to the sea and airy living spaces, Greenparrot Villa is a place that lets vacationers embrace the best of seaside living. Four guests are comfortably accommodated in two bedrooms. Both rooms are furnished in a style that’s similar to the communal spaces; the décor is minimalist and tasteful with darkwood pieces, a simple colour scheme and wooden fixtures. Air conditioners allow guests to lounge in cool comfort within, while canopy netting and quality linens help facilitate a night of uninterrupted slumber. The attached en suite is generously proportioned, and features a vanity, toilet and shower recess. A turquoise pool takes centerstage in the outdoor compound of Greenparrot Villa. Recliners are plonked down in a prime sea-facing spot by the poolside, and the pool extends out towards a spacious lawn that’s ideal for outdoor yoga or playtime with the little ones. Stepping in from the pool, you’ll find yourself within a beautifully appointed glass-enclosed terrace. Furnished with an elegant dining set and a sitting area, this sun-lit venue is where impeccable in-villa dining experiences take place. Lofty, airy and elegant are words that best describe the interiors at Greenparrot Villa. The home houses two living rooms, both of which are capacious and immaculately furnished. The décor is kept simple, with white walls, minimal ornaments and darkwood furnishings. The addition of cement fixtures lends a raw, industrial vibe indoors, and the high, vaulted ceilings adds on to the sense of spaciousness within. Your stay at Greenparrot Villa comes complete with impeccable service. Housekeeping services, as well as daily breakfasts are included with your stay. Lunch and dinner are available at request, as are in-villa massages,Tai Chi classes, tours and airport transfers. The coastal town of Ambalangoda is known for its carved masks and dancers. Dotted around the neighbourhood are beautifully constructed temples, turtle farms and sightseeing attractions. A trip to the Ariyapala Mask Museum is a must-do for villa vacationers keen on discovering more about the history behind the country’s intricately carved masks. While the museum may be fairly small in size, it offers a good display of masks from the ancient times, and the owner provides an interesting, detailed tour of the site. Away from the Ambalangoda are popular attractions like Hikkaduwa. Located about half an hour’s drive from your villa, the town boasts a lively ambience, as well as a vibrant dining and nightlife scene. About an hour’s ride away is the UNESCO World Heritage site of Galle Fort. Best explored through a walking tour, this historic walled city is home to charming streets lined with Dutch colonial buildings, churches, galleries, boutiques and dining establishments. Stop by Lunuganga Estate to take in its beautifully landscaped garden and architecture. 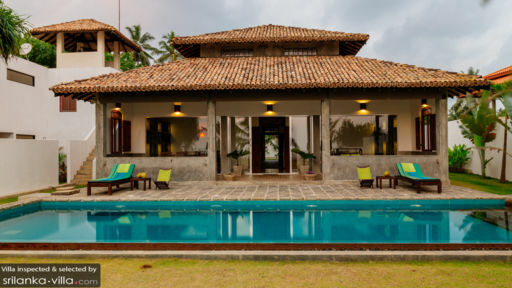 Once home to prominent Sri Lankan architect Geoffrey Bawa, the buildings now operate as a hotel while its grounds are open to the public. Brief Garden, developed by landscaping artist Bevis Bawa is also worth a visit for its lush landscape and atmospheric setting.